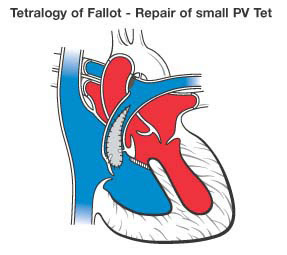 Tetralogy of Fallot has four key features. 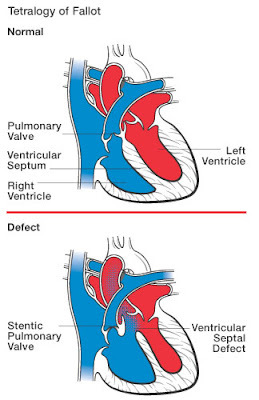 A ventricular septal defect (a hole between the ventricles) and many levels of obstruction from the right ventricle to the lungs (pulmonary stenosis) are the most important. Also, the aorta (major artery from the heart to the body) lies directly over the ventricular septal defect, and the right ventricle develops thickened muscle. Because the aorta overrides the ventricular defect and there's pulmonary stenosis, blood from both ventricles (oxygen-rich and oxygen-poor) is pumped into the body. Sometimes the pulmonary valve is completely obstructed (pulmonary atresia). Infants and young children with unrepaired tetralogy of Fallot are often blue (cyanotic). The reason is that some oxygen-poor blood is pumped to the body. 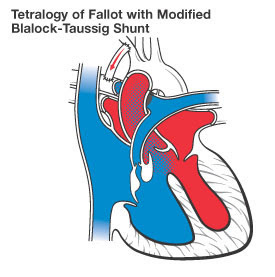 Surgical TreatmentTetralogy of Fallot is treated surgically. A temporary operation may be done at first if the baby is small. Complete repair comes later. Sometimes, the first operation is a complete intracardiac repair. Temporary OperationIn small and very blue infants, a shunt operation may be done first to provide adequate blood flow to the lungs. This lets the baby grow big enough to have a full repair. The shunt is built between the aorta and the pulmonary artery. The shunt is removed when a complete intracardiac repair is done later. Complete repair tends to be done early in life. Once it was more common to do a temporary operation first and a complete repair later in childhood. To do a complete repair, the surgeon closes the ventricular septal defect with a patch and opens the right ventricular outflow tract by removing some thickened muscle below the pulmonary valve, repairing or removing the pulmonary valve and enlarging the peripheral pulmonary arteries that go to both lungs. Sometimes a tube is placed between the right ventricle and the pulmonary artery. This is sometimes called a Rastelli repair.